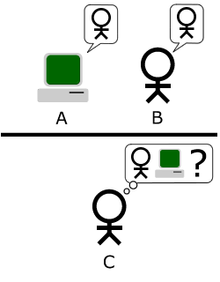 The "standard interpretation" of the Turing Test, in which player C, the interrogator, is tasked with trying to determine which player - A or B - is a computer and which is a human. The interrogator is limited to using the responses to written questions in order to make the determination. Image adapted from Saygin, 2000.